Pos. 4 Mr. Larry Wilson Pos. 5 Mr. John Moon, Jr.
San Jacinto College serves the communities and citizens of East Harris County, Texas. The San Jacinto College taxing area includes the Channelview, Deer Park, Galena Park, La Porte, Pasadena, and Sheldon Independent School Districts. The College's service area expands to include portions of the Humble, Pearland and Clear Creek school districts. ** Portions of Pearland are in the taxing district. The remainder is in the service area. General Service Fee is $150. Based on 12 credit hours which does not include course specific fees, books and other expenses. Fees are effective fall 2016 semester. *Unduplicated College-wide: Cross campus enrolled students are only counted once for College-wide purposes. *Average class size is computed by summing all enrollments in all courses and dividing by the total number of courses. **Full-time and part-time faculty. The student-to-faculty ratio is computed as follows: total unduplicated student headcount divided by total unduplicated faculty who taught a course in the fall semester. Deer Park, La Porte, and Pasadena Independent School Districts. 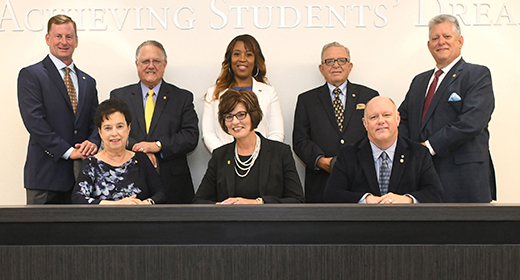 The San Jacinto Community College District is accredited by the Southern Association of Colleges and Schools Commission on Colleges to award the associate degree. Contact the Commission on Colleges at 1866 Southern Lane, Decatur, Georgia 30033- 4097 or call 404-679-4500 for questions about the accreditation of The San Jacinto Community College District. Pasadena Independent School District and a portion of Clear Creek ISD.